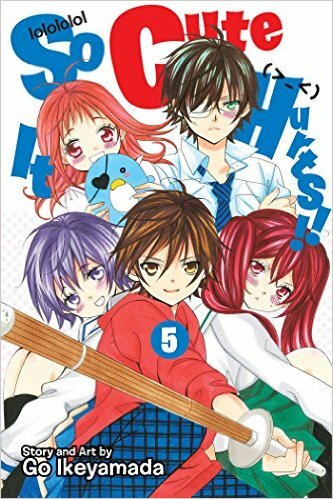 The fifth volume of Go Ikeyamada’s So Cute It Hurts!! is here. This volume continues the story of Mitsuru and Megumu Kobayashi and their journey to close the distances with their love interests. The inches between Megu and Aoi shrink while Mitsuru finally confesses his love to Shino. Despite all of this progress for both twins, love takes an unexpected twist. Sanada reveals a new side of himself to Megu while Mitsuru encounters competition. This volume really changes destiny and sends our main characters in different directions. Okay… Megumu and Aoi’s relationship is about as pure as it gets. In fact, I think it’s a little too pure. I don’t mean that in a way where I think Ikeyamada is overdoing it, but rather in a way where I can see flags everywhere for something that’s about to go wrong. Typically, in a romance story, there are many trials and tribulations a couple will go through before they are finally united together. We are seeing that with Mitsuru, but we’re not with Megumu. The only barrier here is Aoi’s inability to be close to women – we see Megumu close that distance, even if it’s with a few inches. The relationship just seems too perfect so I just have this suspicion that something will happen to drive them apart, but unlike Mitsuru, Megumu has no fall back love interest…. Or does she? Ikeyamada teased that with the introduction of a new character in Todoh. His introduction is the reason for my suspicions. We also got a small piece of the puzzle to Aoi’s past when he had a nightmare about a man named Uesugi. I feel these elements will come together and drive the inevitable wedge in their relationship. On the flip side of the coin, we have a more emotional tale between Mitsuru and Shino. Without spoiling too much, Mitsuru made the decision that no man wants to make when it comes to the person they are in love with; however, it was done to set up the eventual relationship that I hoped wouldn’t happen. It’s the classic cookie-cutter tsundere relationship setup and I only hope that in the end, it falls through and Mitsuru ends up with Shino. I still cannot buy Azusa as a character… I really can’t. There’s really no redeeming qualities that I can get behind to generate any kind of interest in her. I would much rather see Mitsuru work through this issue with Shino alone as it would make a more compelling story, not to mention offer some amazing character growth, rather than the cop out set up we have going on right now. Overall this volume was still amazing, despite my personal “ship” preferences. The volume carried with it a cornucopia of emotions, we got some character development, and some new characters which help enhance the stories that are already set in motion! Can’t wait for volume 6! I like the relationship between Megu and Aoi. It’s cute, innocent, and leaves you wondering what will happen to further develop the story. I know Josh seems to think there are red flags all over this relationship indicating that it’s so perfect it is destined to fail, but I personally found that a few flaws were openly revealed in this volume. Aoi is clearly a jealous person and Megu views his jealousy as a good thing. We all know where jealousy can lead in relationships. Aoi appeared to be rather annoyed by Megu’s dressing as her brother in this volume because it exposed her to boys. I expect Ikeyamada to build upon this. I appreciate what the author did with Shino and Mitsuru. It was unexpected and a worthy twist to the story. Unfortunately, what Ikeyamada did afterwards was completely predictable and circled back to what Josh and I were predicting with dread. Annoying Azusa becomes a more important character in this volume and whole chapters are devoted to her. I wouldn’t mind this if the author actually developed her beyond the cliche character that she is. Unfortunately, Azusa does not develop and remains the same annoying, catty girl we saw in the previous volumes. The only difference here is that Mitsuru is the target of her attention(bullying?) instead of Shino. I hope Ikeyamada cleans this character up in volume 6 because I’m not sure how much more of Azusa I can deal with. I still think this is a good series and I am looking forward to more Megu and Aoi. Hopefully things on Mitsuru’s end get more interesting soon.